Chronic constipation is the top gastrointestinal complaint and it affects people of all ages although older adults are five times more likely to suffer from the condition. Constipation is much more common in western cultures owing to our sedentary lifestyle and consumption of processed foods. There are many definitions of constipation. If you consult your GP he may well tell you that once a week is fine if that's regular for you. However, anyone who only goes to the loo once a week knows that it's anything but fine. There is no doubt that your body will feel better if your bowels are evacuated regularly. Once you get used to being empty you will never want to go back. Our waste is poisonous to us. If the drains in cities only emptied once a week we would soon be over-run with rats, disease and stench. If you were lucky enough to have perfectly functioning bowels then if you eat three meals per day (and that means real meals i.e. fruit, vegetables, protein and whole grains) you should do three poos per day. Ideally, your bowels should empty about half to an hour after eating a meal so that the way in cleared for that meal to be processed. So even if you go every day, but just once, you are still constipated. People who go to the loo every day are always the most satisfying colonics clients. When they come for their first session they are always convinced that given the regularity of their bowels there won't be anything inside. They are always, without exception, amazed just how much excess baggage they are carrying around. 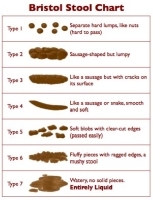 What Health Problems Does Constipation Cause? In addition, antigens and toxins from bowel bacteria and undigested food particles may play a role in a host of other conditions including diabetes, mellitus, thyroid disease, cadidiasis, migraines and ulcerative colitis. Toxins in the constipated bowel damage digestive enzymes in the intestinal wall and cause digestive problems and nutrient deficiencies. The walls of the colon can weaken and herniate, giving rise to diverticulosis. Besides diverticulosis, the excessive bowel transit time associated with constipation can contribute to such bowel disorders as irritable bowel syndrome and colitis. It also creates conditions favourable to the overgrowth of bad or putrefactive bacteria that can have health-damaging effects on the body. Studies suggest that constipation may indirectly cause oestrogen to be reabsorbed. With slow transit times, a low-fibre diet and low concentrations of lactobacilli and bifidobacteria there will be reabsorption of oestrogen. Elevated oestrogen can give rise to many female problems including breast, ovarian and uterine cancer. It will also make you overweight! Are There Alternatives To Taking Laxatives? Really, the vast majority of people suffer needlessly with constipation. Once the underlying cause of your issue has been established it is usually fairly straight forward to rectify. Many people visit their doctor about poor bowel health but the options they are offered are fairly limited - Ihave yet to find anyone that got resolution of their problems from Fybogel, Lactulose, Mebeverine or any of the laxatives that are prescribed. Taking laxatives permanently is not the way to address constipation. Most people have visited their GP at some time with their constipation so I am assuming that you have been checked out by your doctor and there are no other issues which could be contributing to your condition. If this is not the case, please visit your GP prior to following these instructions. You may have suffered from constipation for a long time but don't despair there are many things you can do which will make a difference. The aim is to reduce the transit time of the food you eat and get you going to the loo at least once a day, every day. Once you have deciced you have had enough of being constipated and that you are willing to do what is necessary then you are literally days away from getting going. Make it your focus for the next two weeks by which time you should have developed some useful new habits and be reaping the benefits. Many people totally underestimate the consequences of dehydration. Make no mistake, dehydration is devastating for your health and your bowels. Read the section on Rehydration for the complete low down. Dehydration is the most common cause of constipation so keep your fluid intake up. You may find when you increase your water intake that you will constantly be running to the loo - this will stop after around two weeks so persevere because it will make all the difference and will benefit your health in many ways. You can drink herbal teas/infusions or water: nothing else will hydrate you. So for clarification fruit juice, fruit teas, cordial, carbonated drinks, tea, coffee, flavoured water (is it water with flavour or pop without the colour?) do not count towards your minimum two litres per day. Don't leave it to chance, measure out what you are going to drink during the day and make s ure you do it. Step 2 - Get Things Moving! Do not take laxatives if you can possibly avoid it. Try a colon cleanse product: We stock several very effective colon cleansers. For stubborn constipation Natural TNT is particularly effective. For longer term usage, Oxy is the best seller. Oxy works fabulously well in combination wiyth Col-Clear and TNT. Give yourself an enema – kits complete with instructions are available from detox. Colonic Irrigation – Without a doubt the most effective option, have a colonic irrigation to clear out the colon. As a tactic for dealing with constipation you will get the most benefit if you have three sessions over the course of about 10 days. There are several ways you can increase the fibre in your diet: increase, fruit and veg, increase wholegrains, take a fibre supplement such as Go Daily. The ideal way is to increase your intake of fruit, nuts, seeds, vegetables and wholegrains. For some people it can be quite a challenge. My suggestion is, in order to get results fast, take a fibre supplement in the short-term until you get things going. Doctors often recommend increasing fibre in the diet by supplement with Wheat bran but many people, especially those with IBS, are unable to tolerate it. 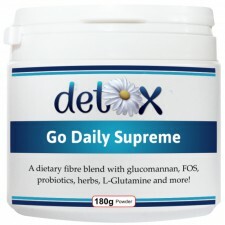 My favourite is psyllium husk which is a major ingredient of Go Daily. By using a supplement you can get results quickly and then work on your diet as an ongoing project. There is absolutely no reason why you should not take Go Daily permanently. I have been taking it daily for around seven years and would not be without it. Very few people have sufficient fibre in their diet and when you add in all the junk we consume it is not surprising people's bowels are struggling. You need 35 grams of fibre per day wehich is quite a lot when you consider an apple has 3-4gm. Psyllium husk however is a fabulous natural product. It absorbs 25 times its own weight in water creating a large, soft gel-like mass which passes swiftly and comfortably through your digestive tract sweeping clean as it goes. Psyllium keeps your waste soft and considerably speeds up transit times (the time it takes from food entering your mouth to it leaving by the back entrance). Start introducing fibrous foods into your diet such as porridge, quinoa, buckwheat, muesli, apples, pears, brown rice, dried fruit, nuts, seeds and lots of vegetables both raw and cooked. Have a look at my bread recipe. It's really easy to make, packed with fibre, very nutritious and totally delicious. Step 4 - Are You Sitting Correctly? It may come as something of a surprise but we are not designed to empty our bowels whilst sitting on a western style toilet. In countries where people routinely use a squat position for elimination they tend to have very much quicker transit times, rarely experience appendicitis or piles, and never get diverticular disease. However, given that we live in houses complete with western style toilets we need to improvise. 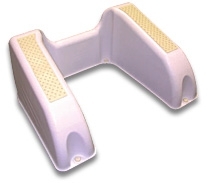 The Health-Step is an ergonomically designed device which fits around the base of your toilet and which will put you in a perfect squat position. The difference it makes is astonishing. So elevate your feet even if it means using a pile of telephone books initially. You should aim for around 80% of your diet to be fruit and vegetables – wet, live foods, rather than dead, dry foods. Avoid very dry food like crisps, Ryvita and anything very salty. Now I understand that for many of you this is the advanced bit. I absolutely believe that our national bowel issues originate in school. Starting school is tough enough but the lack of private facilities makes is a stressful place to evacuate your bowels. School toilets are stressful places and most children avoid using them for anything other than a wee. Emptying your bowels at school could lead to lots of teasing so children quickly learn to hold on. And nothing changes much when people get into the world of work. Lack of privacy, concerns about being noticed missing from your desk, the fear of being discovered or heard all adds to the urge to hang on. The bowel muscle is strong and it is also lazy. It will prompt you once or twice to empty your colon but if you ignore it it will soon give up. When you have the urge to go – go. Once you are going regularly it will be less stressful as you will not have to worry about being stuck in the loo for ages. If you use Go Daily you will find that your stools become very easy to pass, silent, and odourless. So now that you know it is possible to go leaving minimum "evidence" would that make it easier? If you are concerned about odour take a box of matches with you and strike one or two when you have finished – it really works! It gets rid of the odour rather than just covering it up. Poor digestion is another common cause of constipation. As we age there is a tendency to produce fewer digestive enzymes but poor diet can also contribute. Eat fruit on an empty stomach only. If you have fruit as a starter then don't eat anything heavier for half an hour. Do not mix carbohydrates and protein. Now all vegetables have some carbohydrate but the only veg you should not mix with protein is potatoes. So if you have say steak for tea eat it with vegetables and salad but no cheese, bread, potatoes, pasta. Likewise if you are eating cheese, bread, potatoes or pasta eat them only with vegetables, salad or fat. For example butter and/or coleslaw on a jacket potatoe is fine, tuna or cheese is not. Pasta should only be eaten with vegetable sauces. Prepare Food From Scratch: Preparing your own food from scratch leads to much better digestion. Whilst you are preparing food, as the smells and sights start to tempt you, your digestive processes are already starting to work. By the time you start to eat, your stomach is fully prepared to accept the incoming food. HCI Challenge: You can establish if you would benefit from supplementing with digestive enzymes by taking the HCI challenge. Simply take a tablespoon of apple cider vinegar with your main meal – if you do not get any discomfort, burning, warmth or any other sensation, double the dose the following day. If still no sensation then you are likely to benefit from supplementing with Well Digested (Digestive Enzymes). Chew: One of the most common causes of bloating and abdominal discomfort is caused by large volumes of undoigested food hanging around and fermenting in the colon. If you chew your food correctly there should be no evidence of identifiable food (other than corn husks and tomato skins) in the stools. Experement chewing everything 30 times - you may be surprised just how quickly you go to swallow! Concentrate on Eating: When you are eating focus all your attention on your meal. Avoid watching TV, reading etc. Eat consciously and ot only will you enjoy your food more, you will notice when you are satisfied more quickly too. Now you don't have to take up running daily, or spend all your free time in the gym. Even moderate amounts of exercise can have a profound effect on your bowel function. Sounds simple but again it will make a huge difference. Walk: At the absolute minimum take a brisk half hour walk at lunch time. To really make it count concentrate on keeping your core muscles taut and your posture straight. Walk fast enough to be lightly out of puff and push yourself to get a little faster each day. Trampet: Lauded by NASA as the most effective and efficient method of exercise known to man. If you need to kick start your system in the morning try using a trampet (rebounder) when you get up. The forces of gravity will soon have your bowels waking up too. Core Strength: Work on your core strength. Again, you really don't need to bust a gut to gfet improvements. The laziest way of working your abdominal and back muscles is to just pull your tummy in as hard as you can and hold for a count of ten. Concentrate on engaging as many muscles as possible in your tummy from just under your chest to your lower abdomen. When you think you have the muscles squeezed as tight as you can, squeeze them a little more. Seriously, do this exercise ten times per day and you will have abs of steel in a couple of months. Now before you dismiss it out of hand, colonic irrigation is well worth considerng. When you have been hauling a colon load of stagnant waste around with you, you will be astonished just how good it feels to be empty. If you have been experiencing constipation for some time then it is most likely to take several sessions to get things moving. On your first session you can expect the slow moving waste to be removed whilst subsequent sessions will remove older waste material. Generally three sessions over two weeks, in conjunction with increased water and fibre intake, will have most people going daily. More stubborn cases may be better with six sessions. Food sensitivities are another cause of constipation one of the most common of which is lactose (from milk) intolerance. I do a lot of testing however and have found that almost any food can be causing constipation if it does not agree with you. Spinach is a common culprit. If you have implemented all the other suggestions and are still struggling have a food sensitivity test (available by appointment at detox). For full details read the Food Sesntivitiy Testing section. Calcium, magnesium, Omega 3s and Folic Acid are also extremely important in bowel health and deficiency can cause constipation. Aloe Vera juice is a mild, natural laxative with a healing and cleansing effect on the digestive system. Taking Milk Thistle will support your liver to deal with the toxins associated with constipation.